As Coast to Coast Sweden looms nearer I have begun to think about the kind of shelter I will use this year. Last years event was cold and damp, moisture was literally dripping from both the inner and outer walls of the Hilleberg Enan I used. 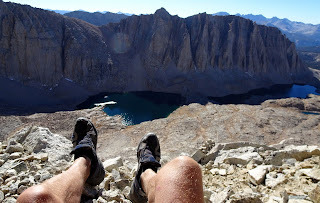 The same heavy condensation was also a factor when I hiked the John Muir Trail in October, using a Gossamer Gear The One for shelter. So I have decided to make a shelter that will beat both of those for use in protected areas, like the forest. What I am looking for is spacious, windproof and well ventilating shelter that does not weigh more than 500 grams. I will start with the Cuben fiber tarp that you see in the above photo, from my packrafting trip down the South Nahanni River a couple of years ago. In this photo it is an extra roof over my Gossamer Gear The One. During this trip when I backpacked into the Moose Ponds, source of the Nahanni, and then drifted down the river, I had some special needs. The tarp was usually where I did all my cooking, if it was raining. I pitched it a goodly distance from the tent, to minimize the risk of attracting bears to a sweet smelling tent with me sleeping inside. 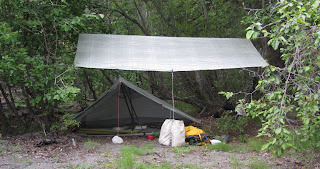 I also used this tarp, weighing 200 grams, as a sole shelter for Coast2Coast Sweden in 2013. It worked well, pretty condensation free, but on a windy night (I did not use a bivy) the exposed sleeping bag left me less than warm. I have an innertent for my Trailstar that I have used for a couple of summers in Alaska as well as on the tundra in northern Sweden. The lower part is windproof and the upper part of this inner is bug mesh. A good combination, but less warm than a full fabric inner tent. The plan now is to make an inner tent from lightweight ripstop and use Cuben fiber for a waterproof floor. In combination with the tarp this should be a good solution for 'hinge' season backpacking where temperatures hover around or slightly below freezing. 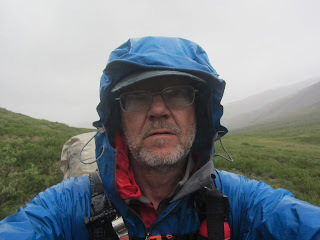 For exposed areas above timberline this is probably not an ideal solution, it might not be able to manage high winds and drifting rain as well as for instance my Trailstar or a 'real' tent. I will keep you posted on how this project develops.